In a country rubbish collection is substituted with local bomb-fires, with no recycling facilities more sophisticated than the child rag pickers and where a ‘carbon foot print’ means no more than a sooty mark your feet make, encouraging ‘green’ behaviour is an uphill battle. 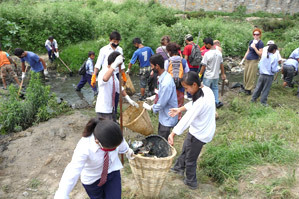 Having said that, Umbrella loves to back the underdog, so when the opportunity arose for the children, staff and volunteers of Umbrella to join the greater Swoyambhu community in an effort to clean the Bishnu Bathi river, Umbrella raised their hands and eagerly volunteered. On a very hot Sunday 70 of the older children, 20 staff and volunteers went to the river cleaning festival with armour of plastic bags, protective gloves and face masks and everyone got stuck in getting dirtier as the river got cleaner. To look at the river now you wouldn’t guess that there was a small army of cleaners attacking it earlier this month but that wasn’t the goal of the day. The real result is in the altered mentality of the community and the Umbrella children towards their role in preserving the environment.